Grantsboro, NC Bojangles'® Tands, INC. Store #47 - Bojangles'® / Tands, Inc.
Get delicious southern fried chicken, fast, friendly service and affordable food — all at Bojangles’® in Grantsboro, NC! Our newest location in Grantsboro offers the same great Bojangles’® food that customers have come to love and crave. We open early so you can get your breakfast first thing. We also serve breakfast items all day long, so you can enjoy your favorite Bojangles’® breakfast biscuit sandwich for lunch and dinner, too. But, with our tasty fried chicken dinners and salads as choices, it’ll be a hard call to make. Get what you crave today, because it’s Bo Time! 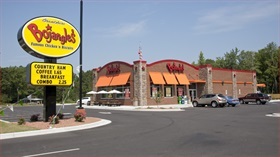 Our Grantsboro, NC Bojangles’® is Tands/Bojangles’® 50th store. It is the first to feature an updated, casual design to create a relaxed atmosphere. Come enjoy this new Bojangles’®! We’re a great place for Grantsboro, NC families and friends to enjoy good food in great company!